Some listeners have been asking about how Alabama Public Radio is funded. Your source for unbiased news and information is funded by listeners, underwriters, The University of Alabama and the Corporation for Public Broadcasting (CPB). You may have questions about how we get funding to produce and air content for the listeners. We hope these answer your questions. If you have others, please contact jeff.deneen@apr.org . We will respond as quickly as possible them. What is CPB's role in public broadcasting? · Uncle Sam spends only a dollar and thirty five cents per taxpayer per year to fund public TV and Radio. The Corporation for Public Broadcasting (CPB) is a non-profit corporation created by an act of the United States Congress (the Public Broadcasting Financing Act of 1967) and funded by the United States federal government to promote public broadcasting. CPB receives a two-year appropriation from Congress that it distributes to local public television and radio stations. · CPB’s mission is to encourage program diversity and to expand and develop non-commercial broadcasting. CPB funds help local stations create innovative programs, thereby increasing the service of broadcasting in the public interest throughout the country. Why does public broadcasting need federal funding? · Federal funding is essential to the funding mix that supports public broadcasting. CPB funding provides critical seed money and basic operating support to local stations, which then leverage each $1 of federal funding to raise over $5 from local sources — a strong return on the taxpayer investment. · Federal funding provides essential support for public broadcasting’s mission to ensure universal access to high-quality, non-commercial programming that educates, informs, enlightens and enriches the public, with a particular focus on the needs of underserved audiences, including children and people of color. · In many rural areas, public broadcasting is the only source of free local, national and international news, public affairs and cultural programming – and with such small populations they often rely more heavily on federal funding. Without it, these stations would likely be unable to continue to provide local communities with news, information, cultural and educational programming that they currently provide, and could even go off the air altogether. · In addition, the CPB helps negotiate music rights for all public stations and provides administrative support, allowing stations to aggregate together for cost-effective sharing of information, research and services. The “pay back” - You know NPR and Alabama Public Radio works, and now there’s tangible proof. A study by Fairleigh Dickinson University asked news consumers questions about domestic and international news, and ranked them by what news source they use. Listeners to public radio consistently scored higher. The audience of NPR and Alabama Public Radio are simply smarter. · Funding for the current fiscal year, FY2017, has been distributed to the CPB, and first payments have been made to stations, including APR. · The appropriation for the CPB is booked two years in advance, which is designed to provide a buffer between funding and changes in the political climate. Therefore, funding has been secured for FY2018 and FY2019, but has not yet been distributed. Technically, these appropriations could be rescinded, but it would take an act of Congress to make that happen. 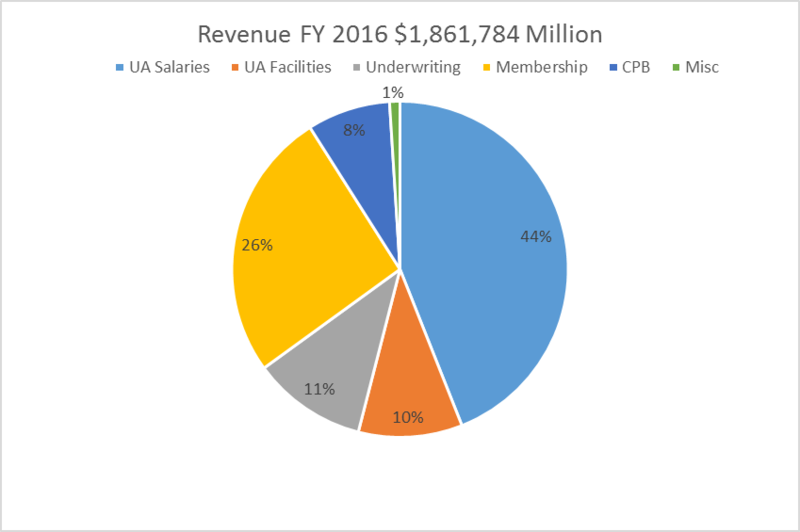 How much CPB funding does APR receive? · In 2016 (APR’s last available audit) APR received $155,684 from the Corporation for Public Broadcasting. This amounts to approximately eight percent of APR’s total revenue budget. What would a loss of Federal funding mean for APR? · We anticipate that the loss of Federal funding would affect APR in two distinctly different ways. Listener support might well increase in response to fundraising efforts that utilize the loss of CPB funds as a reason to give or to give more. However to offset the loss of CPB funds would require a 32% increase in listener support—that seems unlikely. Consequently, in addition to pursuing new sources of revenue, APR would have to look to cost cutting measures as well. · The largest single cost for APR is programming and production. We can anticipate that any expense reductions would by necessity affect APR’s program service. Public broadcasters who have undergone budgetary cuts in state funding have found that locally produced programming is most severely impacted. · A strong, diverse base of grassroots advocates is essential to ensuring the retention of federal funding. A great resource is the Protect My Public Media website.